The beach is always a favorite place to draw and experiment with new designs. 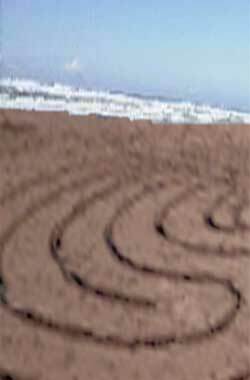 The sand in the morning is moist enough to use a simple stick and draw a design large enough to walk or small enough to follow with your eyes. I experiment and wipe away what I don’t like and add something new as I develop an idea or image. I’ve also just like to leave behind designs and wonder what becomes of them between the tides and the others who come along to discover this interesting design left behind.